The resources you’ll find below are documents that have been distributed by the Injury Prevention Center. These resources were developed based on evidence-based injury prevention research. This document highlights the SafERteens program, a brief intervention aimed at reducing and preventing violence and alcohol use among urban youth engaged in youth violence and alcohol use. 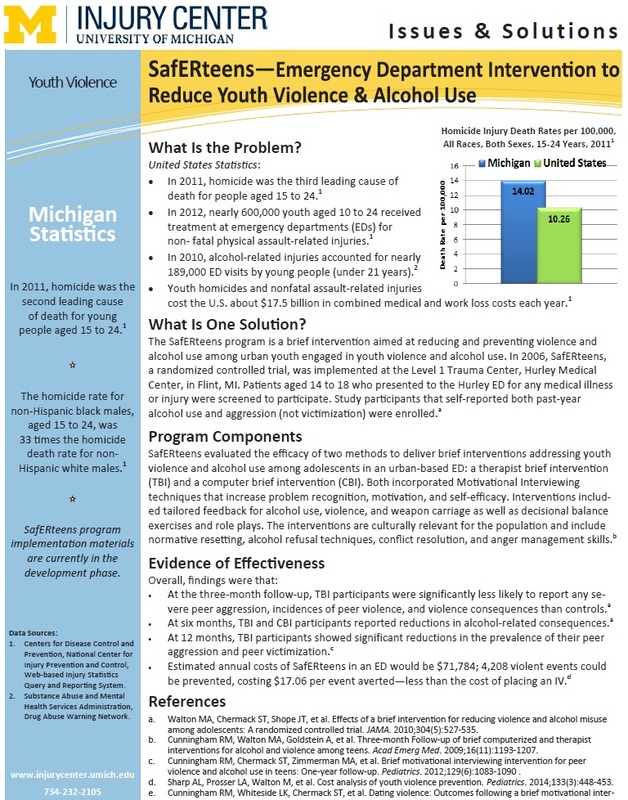 This handout gives information on youth violence in the U.S., information on the highlighted evidence-based solution and the components of the program, and the evidence for the program’s effectiveness. 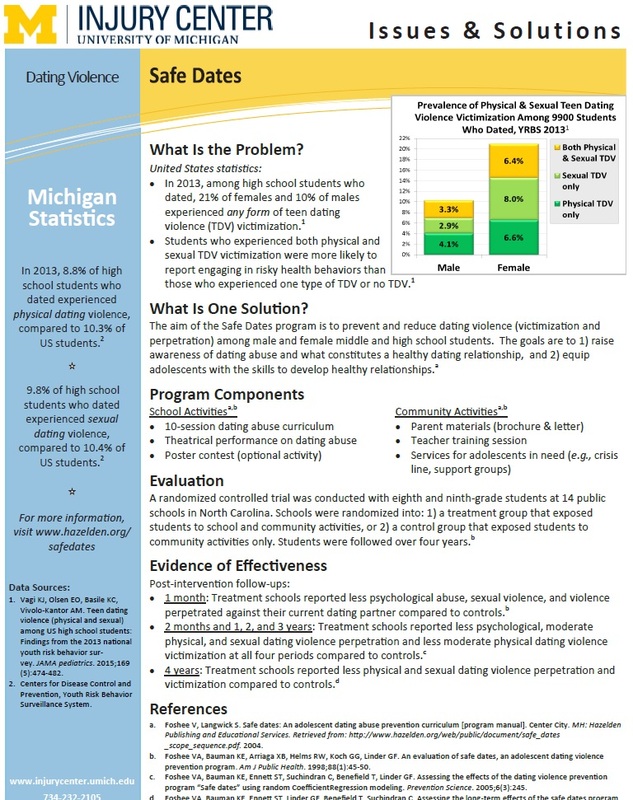 This document highlights the Safe Dates program designed to prevent and reduce dating violence (victimization and perpetration) among male and female middle and high school students. 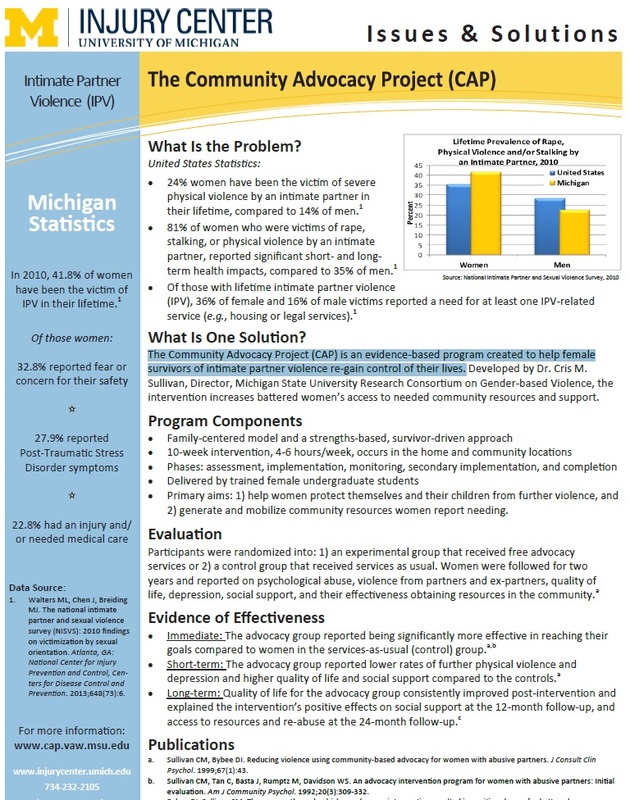 This handout gives information on dating violence statistics in the U.S., information on the highlighted evidence-based solution and the components of the program, and the evidence for the program’s effectiveness. Document highlights Relationship Remix, a program designed to teach first-year college students about consent, communication, decision-making, sexual health, and healthy relationships. Document highlights the Community Advocacy Project (CAP), an evidence-based program created to help female survivors of intimate partner violence re-gain control of their lives. 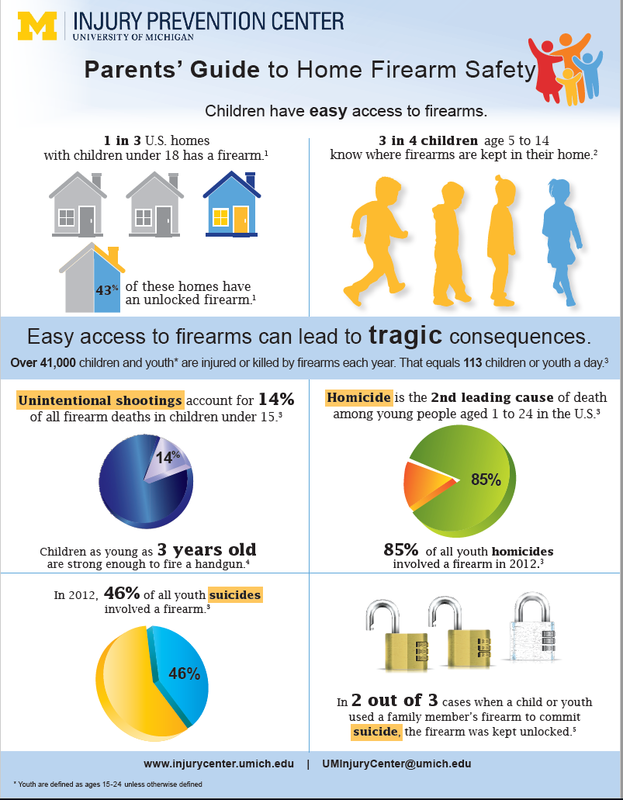 The U-M Injury Prevention Center has just published a one-sheet guide for parents to ensure home firearm safety. We invite you to download and disseminate this flyer broadly. 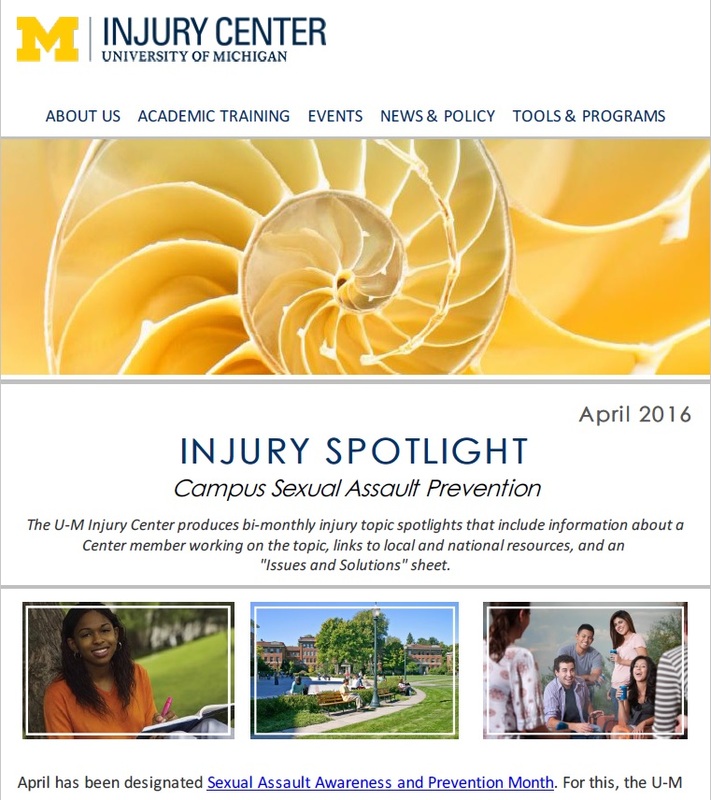 Spotlight on campus sexual assault prevention, member highlight (Ms. Holly Rider-Milkovich), resources. 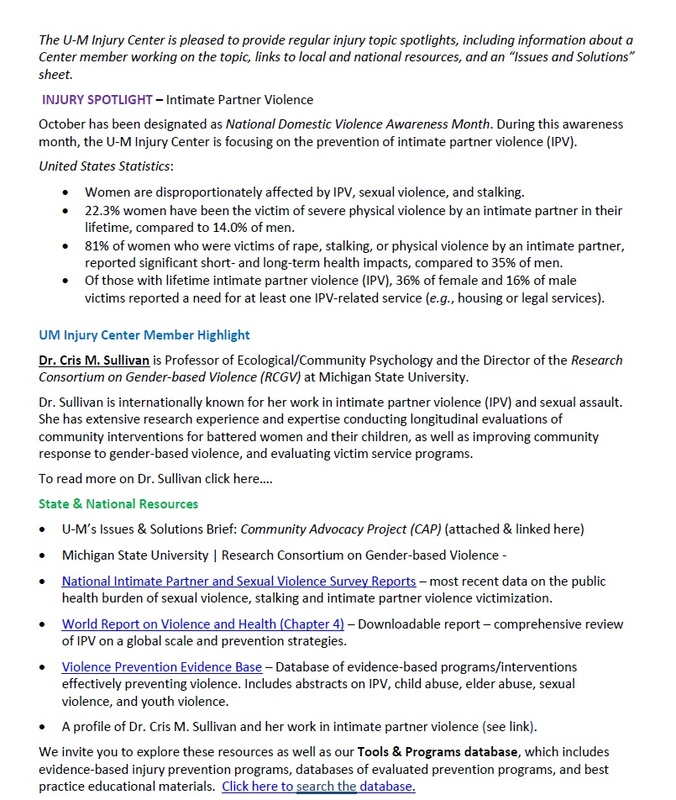 Spotlight on intimate partner violence, member highlight (Dr. Cris M. Sullivan), and resources. 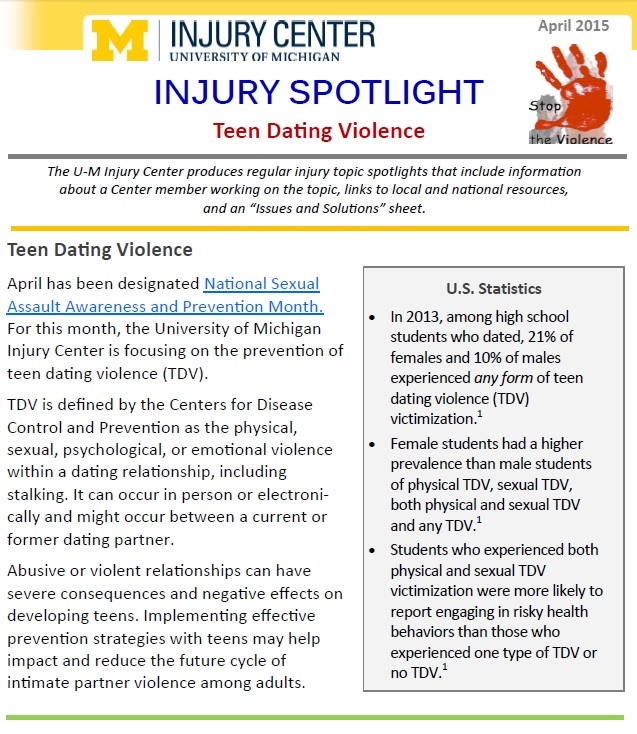 Spotlight on teen dating violence, member highlight (Dr. Antonia Abbey), and resources.